The underlying principle behind good video editing is to skilfully weave well-visualized video clips to tell a story as it is, but sometimes the result may lack the feel envisioned in your mind. Therefore, video trimming adds rhythm and energy to your video by succinctly bringing out its inner meaning. If you cannot own high-end editing tools and skilled resources to drive buzz with your videos, then you deserve the help of video trimming professionals like us. At Outsource2india, we are never short of creative minds and high-precision video editing tools. We fuse the skill and technology to bring you video trimming services that are a bang for your buck. So why wait? Get started by outsourcing video trimming services to us. When you offshore video trimming services to O2I, we meticulously trim, craft, and connect video clips like working a complex piece of the puzzle. Unlike video cropping, the purpose of video trimming is to retain, remove, or move video clips from a master footage without altering the original content and its inner meaning. In video trimming services the creative decisions begin from the moment an editor views the master footage. The purpose is to identify rough edges that require refinement. After video assessment, the decision is made based on which portion requires trimming, the sequence of clips, and desideratum for splitting the video into smaller clips. Multiple clips can be trimmed and stitched in the master footage by selecting portions with a flag or by entering the start and end time. It's that simple! What is Included in the Video Trimming Services Offered by O2I? Video trimming is a high-precision process of selecting and retaining portions of the master footage that are valuable without losing the subtilty of its meaning. However, if you are looking for an additional touch of creativity, we can splice the trimmed clips in any sequence of your choice. We analyze each video clip while it is adjoined with another because it facilitates a smooth transition between scenes to retain grandeur in the story conveyed through the video. However, this is not the case when clips are worked upon in isolation. In addition to cropping, we also perform color correction, add effects, adjustment to brightness, and much more. What Process Do You Follow for Video Trimming? Why Choose O2I for Video Trimming Services? Outsource2india is seen as a reliable video trimming partner because we are ISO 9001:2015 certified. We take pride in becoming ISO certified because we stop at nothing to offer high-quality video trimming services. We walk the extra mile to bring you a secure ambit where your project will be handled by skilled professionals with utmost care. We also have a highly secure network which facilitates movement of confidential data without facing interruption from external threats. Our unwavering effort to ensure data security is lauded with ISO/ICE 27001:2013 certification. Quality is the pinnacle of our video trimming services. All that we ask is to trust us while we dedicatedly edit your videos with accuracy and perfection that no other provider can match. If you have envisioned the finished video we can help you realize results in the very same way you have imagined. We work with great agility to prevent delay in the stipulated timeline. We are highly concerned about our customer's demanding timeline. At all costs, we will bring you finished results without delay. By joining hands with us we can deliver the edited videos 15% faster than every other editing company. If you have a tentative demand for video trimming services, we are ready to handle your requirement irrespective of the volume. We can adapt to rise and fall in your demand with scalable video editing services. Partnership with us can benefit you cost-wise because our video trimming services can be customized to many factors. Therefore, we will assign a representative who will collaborate with you to provide the best support while choosing a budget-friendly video editing service that fits within your budget. Most clients have a concern regarding a dedicated support because they are often forced to face tiresome queues before they can reach a support agent. Well, not with us. We offer a dedicated project member from the outset to give you timely updates as well as the service support. Being a leading provider of video trimming services in India, we have editing specialists who are aware of the most recent video editing practices. 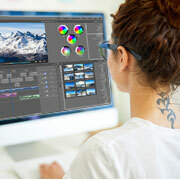 Our video editors have a decade plus experience in various editing tools available in the market and can handle projects of various complexity levels. We always upgrade our security and technology infrastructure to keep up with the evolving trends and demands in video editing. Our efforts are focused on staying ahead of the curve and to serve clients with ultimate passion and efficiency with the best infrastructure. We are never short of the right tools required for the video editing process. Since we emphasize on reliability we routinely procure advanced proprietary editing software that comes with timely support and updates. This ensures continuity in the work without disruption. We use high-end data sharing channels such as SFTP and VPN that facilitates not just high-speed data sharing but also a safe way to send and receive data without risking data loss. We use robust software to check the health of communication systems. We can be reached through our contact center support channels anytime, anywhere. You can shoot us an email or dial the support number to get in touch with human operators. We can also be contacted through the chat support for faster and real-time response. Color correction services were provided by O2I to a leading movie restoration company. We not only provided a reliable solution but also helped them in quick TAT. Wedding film company based out of Ontario was provided video editing services. Our solution proved to be effective cost and time wise. Video trimming solutions are in demand due to growth in demand for video content. To keep up with this demand we can edit your videos to your specification faster than anybody else. In 20 years, we have successfully established ourselves as a committed provider of creative design solutions. Today, we take pride in becoming a true world leader in not one but many other specialists services such as illustration services, design services, artwork services, logo design services, and more. Contact us and out outsource video trimming services if you are looking for clever ways to save cost and time without discounting the quality.